A few weeks ago, I got an e-mail from Ashley Hubbard of Fleurir Chocolates, asking if I'd like to try some chocolates from her and her fiance's freshly created artisan chocolate business. If there's anything that cacao-crazy San Francisco has instilled in me, it's an appreciation of chocolate as couture. I think it's astonishing that I live in a city where I can walk into boutiques that carry chocolates from all around the world, where I can think of offbeat combinations like strawberry balsamic caramel and there's likely a chocolatier that's making that flavor, that there are so many local chocolatiers practicing the noble art of converting theobroma cacao into perfect little tiles of delight. Although the profusion of artisan chocolate might seem intimidating, I'm always delighted to see newcomers entering the scene: if anything, the abundant creativity and impressively high level of quality I'm seeing from these new faces tells me that there's plenty of room left for the world of chocolate to expand. I received a sample box of Fleurir's nine piece box from Ashley – I'll have to admit that after the first bite, I was tempted to hoard it all for myself! 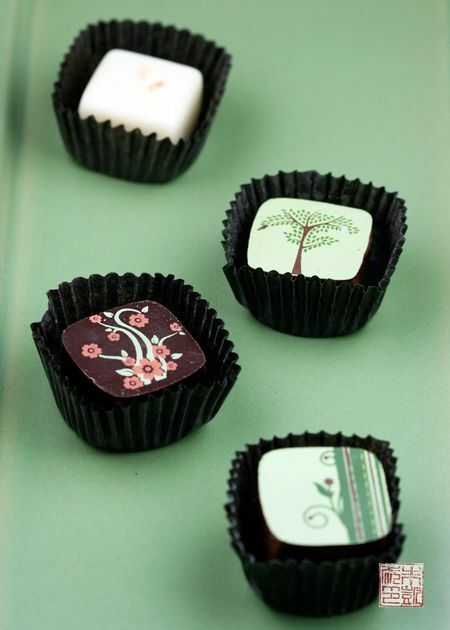 Fleurir's Chocolates come in elegant squares, either minimally decorated or imprinted with transfers. I was taken by the green, botanical theme that extends throughout the designs, a gorgeous way to tie their line together. Flavors from top right, clockwise: Cheesecake, Almond Amaretto, 85%, Raspberry, Coconut Lime, Grand Marnier Orange Blossom. The flavors range from clean renditions of classics like raspberry and sea salt caramel, to some intriguing variations like lavender shiraz (the mix of dark chocolate with notes of wine and floral lavender make me think of drive in the country in spring) and ginger rogers, a tingly mix of ginger and mint (Ashley indicated it was inspired by one of her favorite drinks). The ganaches are beautifully creamy and flavorful, the shells perfectly snapping under the bite. Ashley's fiance, Robert, studied at the Le Cordon Bleu in Australia and worked under Tim Gearhart before heading out to start his own business. I love the fresh green aesthetic of Fleurir – it means " to bloom" in French and Ashley said that captured their vision of spring, growth, and beauty. She mentioned that they considered Bloom for a name but didn't like the connotations with fat bloom in chocolates – I love me some food geeks! They've got a beautiful presentation going, which along with the high quality of their chocolates really gives them a leg up in the crowd of chocolate competition. 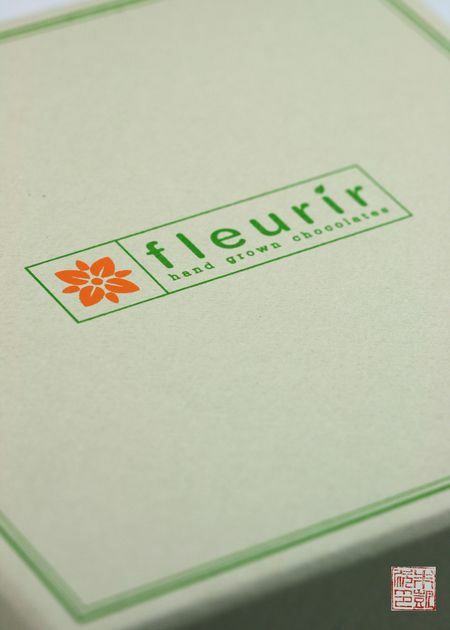 Fleurir is currently based in Virginia, and their chocolates can be bought online. They have just released a special Heart's Delight Box for Valentine's Day, which includes new Pink Peppercorn and Dark Raspberry flavors, with 40% of the proceeds going to the American Heart Association – a sweet deal! In our e-mail correspondence, Ashley had mentioned her affection for California, and I asked if Fleurir might branch out west. 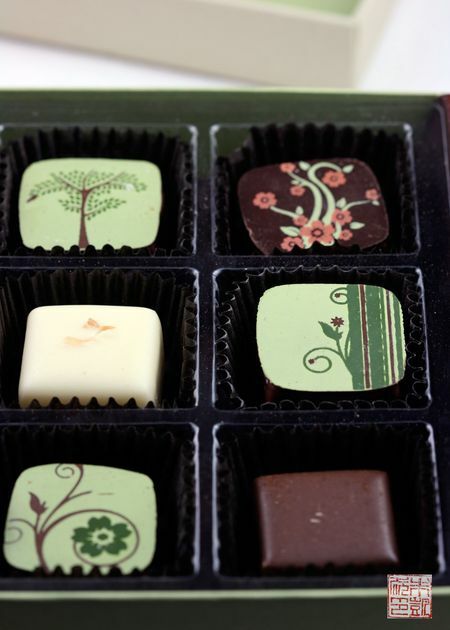 Maybe in the future was the reply, so while we're waiting for an SF shop to open, do go over to their website and order a box, and try some hand grown chocolates for yourself. Maybe no food in the world carries more artistry than chocolate work. When you see something that exquisite, it’s hard to eat it. Chocolates, I fell in love with them in CA too many years ago. Truffles and that is it for me, really good truffles. Oh, this looks terribly delicious. They’re too pretty to eat ! win a box of vosges chocolates. yum!